Fractured teeth demonstrate many symptoms, including pain when chewing, temperature sensitivities, or even the release of biting pressure. It is also common for pain to come and go, making it difficult to diagnose the cause of discomfort. Chewing can cause movement of the fractured pieces of tooth and the pulp within the tooth becomes irritated. At the same time, when biting pressure is released, the split can close quickly, resulting in sharp pain. Eventually, the pulp will become damaged and tooth will consistently hurt, even when you are not chewing. It is possible that fractures can lead to infection of the pulp tissue, which can spread to the bone and gum surrounding the problematic tooth. 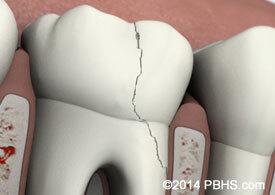 These are tiny fractures that only affect the outer enamel of the tooth. These fractures are more common in adults. These types of fractures are superficial and are usually of no concern. 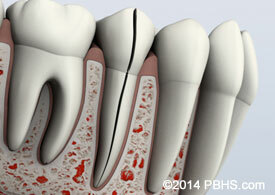 This type of fracture extends from the chewing surface of the tooth and vertically migrates towards the root. In some cases, the split may extend below the gum line. It is possible for the fracture to extend further into the root. Damage to the pulp is commonplace. In this case, root canal treatment is usually necessary. 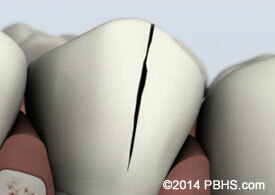 A fractured tooth that is not treated will worsen, resulting in the loss of the tooth. Therefore, early detection is essential. 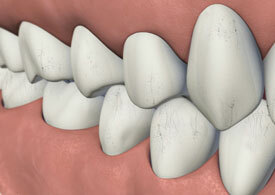 A split tooth is usually the result of an untreated fractured tooth. It can be identified by a fracture with distinct segments. This type of tooth can never be saved intact. Yet, the position and extent of the problem will dictate whether any portion of the tooth can be saved. Sometimes, endodontic retreatment by the doctors and restoration by your dentist can be used to save a portion of the tooth.